The last night of the month brought three new arrivals and took the species tally for May to a much higher level than I had been expecting. 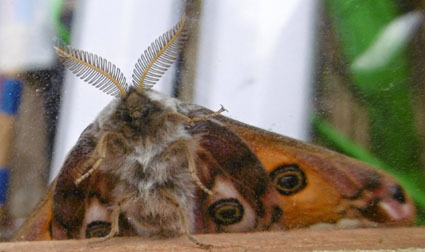 Rather a lot of cold and wet weather has left the moth-fancying world - that notable fraternity and sorority - feeling a bit grumpy and dissatisfied. But in my case, without real reason. I'm going to do one of my Good Housekeeping audits here tomorrow, but suffice to say that the monthly total is now somewhere in the mid-sixties, not far short of last year's bumper 73 and far better than the 40 recorded in 2013, my first year of Oxford entomology. There have been some notable absentees so far, including the Elephant Hawk moths, but life in general is good. And I was very pleased with the reception accorded to a 'tame' Poplar Hawk which I took to friends last night. It is now exploring Summertown in north Oxford. The most prominent of the newcomers last night was the Scalloped Hazel in my top picture, followed by the delicate White-pinion Spotted - a curious order of words to my way of thinking; I would expect it to have been called the Spotted White-pinion but there we are. It is a common moth in the Midlands and South but also has a little stronghold in South Cumbria, rather like Londoners who maintain a hideaway in the Lake District. The third new arrival, above, is the very subtly and agreeably patterned and coloured Coronet and then we have a Juniper Pug below. Update: no, Dave Wilton confirms that it's a Mottled, which seems the commonest pug in this part of the world. Much the most common moth in the trap was the Common (appropriately) Swift which comes in so many variations, including this rather striking grey form. This could possibly be a close relation called the Map-wing Swift. If the amazing and beyond-praise Ben is reading, he will know, or I may ask the experts on the Upper Thames Moths blog. Finally, micro time. And time is what I need to sort out these little chaps. I have a couple of others in my unsolved file (which Ben entirely cleared yesterday so far as macros are concerned - what a hero). So there will be more news soon. Hope you are having a nice and not too wet weekend. This is a very practical posting as you will discover, but I thought that I would start it inconsequentially before we all get down to business. The day got off to a good start, in spite of very meagre attendance in the moth trap, when an imperious-looking Sparrowhawk settled on top of our bird feeder and fixed out breakfast-making in the kitchen with his, or her, beady yellow-rimmed eye. "Now don't go too far dears!" "That's better - plenty of food to dabble for near the bank." "All content? Then I'm off to Tesco in Kidlington." And to so to the nuts and bolts. I've assembled in one place, for convenience, all the May moths whose ID I've failed definitely to crack. I've put my best guesses on a lot of the captions, but would as always be grateful for more expert views. A big THANK YOU in advance. Update: and a VERY BIG THANK YOU to Ben Sale, who has gone through the whole lot, corrected those I got wrong and ID-ed those I left as mysterious. MUCH appreciated, Ben. Common Marbled Carpet? Yes! Yay! I don't suppose you ever expected to turn to this blog and find a moth flicking a V-sign at you. But there it is, courtesy of the very bizarre-looking Pale Prominent. Apart from its soft, grey colouring, this curious creature reminds me of a Cadbury's Flake, those chocolate bars whose yellow wrappers had to be folded into a funnel at school to make sure the little flaky bits which had crumbled off didn't end up on the desk or floor. More relevantly, it also resembles a bit of twig and I would imagine that this gives it a particularly good record in escaping predators. Mind you, the hunting mechanisms of birds are very different from ours and I suspect that movement by prey is more important in many cases than appearance. I say this because I have sometimes carelessly left the eggboxes out with moths also lying on my kneeler pad, when I have been distracted after photographing the morning's catch, and in almost all cases they have survived the attentions of inquisitive robins and blackbirds. It is only the male Pale Prominent which has the twin tails and, given that the tip of a moth's body is where the action takes place in breeding terms, I guess they must serve some purpose related to sexual attraction. Note, though, that the moth is nicely proportionate, with equally long palps, organs primarily designed for testing whether material is edible. Here are some of last night's other visitors, which I have yet to identify apart from the dark-n-light couple of Heart and Darts and the Common Wainscot at the bottom. It was a busier evening than most have been recently, probably because of warmer temperatures. Update: I have taken my courage in both hands and put my best shot at IDs in the captions. Endorsement or ridicule equally welcome. Update: I think this is a Clouded Drab. Further update: nope, Dave Wilton says it's a Rustic Shoulder-knot. My title today is meant to be a sneeze - maybe I should have added 'Bless you!' - because this morning the year's first Peppered Moth was stylishly perched in one of the eggboxes. This is a nice coincidence because last week I had an email from Cornell University Press in the States saying that they were potentially interested in using a picture from one of the many previous mentions I've made of the Peppered Moth here. I didn't ask the subject of the book when replying to say Yes, but I am sure the reference will be to the Peppered's hallowed place in the science of genetics, through the rise and fall of the melanic, or dark, version of the species and its relationship with the parallel rise and fall of pollution. This was most entertainingly illustrated by the great entomologist and doctor Sir Cyril Clarke, who famously plotted a graph showing similar curves for (a) the decline of the melanic Peppered in the UK and (b) the rise in centenarians here during the same period, when much of the dreadful, unhealthy legacy of our industrial past was at last brought under control. Scientifically, the Peppered plays a wider role as a striking and easy-to-understand example of Darwin's natural selection in action, though you will find many a furious counterblast to this from Creationists online. My pictures show, at the top, today's Peppered Moth and below, the picture of both types when they flew in together on the same night in 2013 - the one which Cornell UP may use. I hope they do. The other feature of this moth which I've noticed over the years is how neatly it positions itself in the eggboxes which happened again this morning - the wings conforming almost exactly to the angles of the cone. This has been taken in previous years to the lengths of the moths sitting on the barcodes which have a vaguely similar black-and-white pattern to their own. 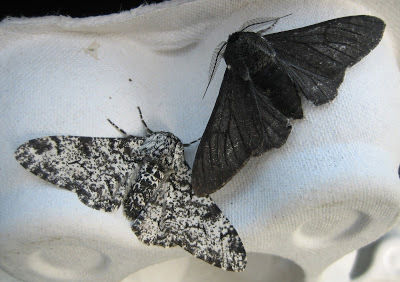 The point about the correlation of melanism with pollution, I should have explained earlier, is that in sooty areas the dark moth was less likely to be predated than the standard, peppered one which conversely survives better in cleaner surroundings where the melanic moth stands out as a dark splodge. In my last post, I foresaw another night of abundant moths. This proved correct but only in terms of numbers. There was nothing new or especially interesting among the overnight visitors on Monday. Perhaps the novelties took Bank Holiday off to enjoy themselves elsewhere. Last night was even more unrewarding with under a dozen moths in the eggboxes and all of them familiar - a Swallow Prominent, a Flame Shoulder and several browny-grey bretheren. Mind you, we were back late and I didn't light the lamp until gone ten. The night seemed warmish then but it was quite nippy this morning - all things to discourage May moths. I do have something to report, however, in that I had second thoughts about the gender of my Puss Moth, featured two posts back, and so confined him or her to a large box with willow leaves inside to see if I could repeat last year's highly enjoyable breeding of Emperor moths from eggs (four pupae from that family still slumber on). I don't think this latest experiment has succeeded but there are eggs on the willow - the yellow ones in the picture above. They don't look like the browny pellets shown online for Puss Moth eggs and they are in a much larger cluster than the ones, twos or threes which the Puss Moth usually lays. But I will keep an eye on them and try to breed whatever emerges, unless it is something nasty from elsewhere in the insect world. The mystery is that there didn't seem to be another potential egglayer in the box and I hadn't noticed the eggs when I put the willow inside. But then, there are a lot of things I don't notice. In the absence of moths, I thought you might also like to see a couple of our many goldfinches eating their strange diet of thistle seeds. Beautiful and very unBritish birds, in that they are brightly-coloured, they have a monopoly of one of our birdfeeders because no other visitors can get their beaks through the tiny holes. I mentioned earlier today that my lovely Puss Moth was attended by a veritable army of other overnight guests, and here are some of the more interesting (and those whose identity escapes me, as is so often the case). These first two are examples of moths with metallic markings produced by light-reflecting wing scales rather than the usual pigment; the Gold Spot above and the Plain (although actually very far from plain) Golden Y below. Next we have one of the most strangely-patterned of our native species, the Scorched Wing, whose curious colouring has influenced 'dazzle camouflage' which disorientates the eye and was used to good effect in naval ships during the First World War. Common Swifts have been extremely common visitors to the trap in the last fortnight and fgeature in recent posts but the next moth is the first of the completely plain examples which occur from time to time, with none of the bold white markings of most of the type. Next, the year's first Marbled Minor, followed by a Treble Lines, another debut, and two returnees, Lychnis and a Flounced Rustic Update: the last is actually a Clouded-bordered Brindle, sorry. Here's another nice newcomer, too: a Buff Ermine, perched alongside a capsized and sleepy White Ermine, its close relative. And now a couple of the Carpets' even smaller (and harder to identify) relatives, the Pug moths. I think that the first is a Common Pug - but Update, thanks to five-year-old Aidan in Comments, I now agree with him that this is a Dotted Pug - and the second (more shakily cos it seems too early) a Bordered Pug and the third (also shakily) a Mottled Pug. Correction and advice warmly welcome. And lastly, two of my lifelong enemies: dull grey moths which I never seem to be able to nail. Could the first be that sadly-named creature, the Lead-coloured Drab? Loads of moths then, and loads of work to do too. And another excellent night isunder way as I write, at least in weather terms, so I predict much more to come. Can blackbirds have two wives?